Off-court colorways of on-court signature shoes may be a regular thing these days, but back in 1990 there was a bit more separation. 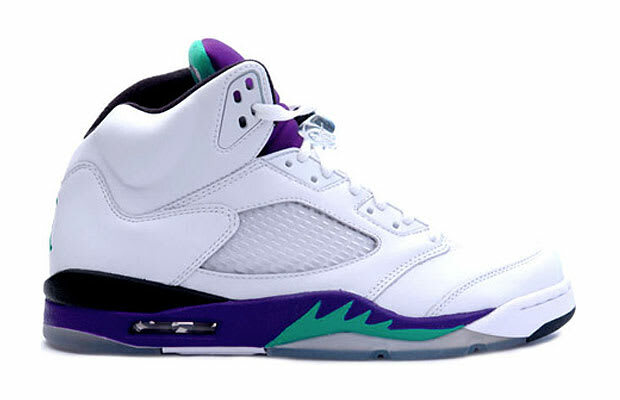 The Grape Ice/New Emerald Air Jordan V may not have been the first Air Jordan to appear in non-Bulls colors - the Air Jordan 1 was produced in tons of off-court colors, and the "True Blue" IIIs didn't have any affiliation - but it was the one that you can consider the direct ancestor of all the rest. The one retro was nice and all, but this one can't come back again soon enough.